To ensure a successful installation of a precast box culvert project, the site must first be prepared. 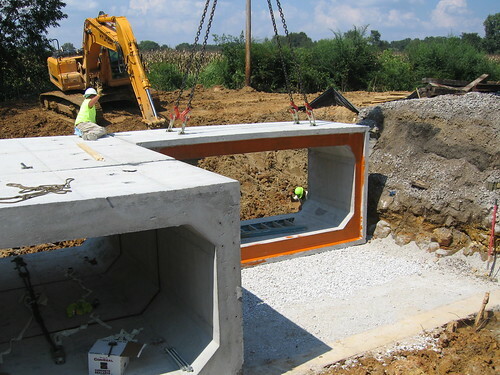 Precast concrete box culverts need to have special site preparation for the foundation on which it will rest. The box culvert foundation is typically referred to as bedding. Box culvert installation should be done by an experienced contractor who understands the importance of bedding the structure properly. The bedding under the box culvert must be able to support the full load of the installed box culvert, its contents, and the loading above the box culvert. The surface and subsurface water should be controlled so dry conditions are available during excavation and site preparation. Furthermore, during and after installation, dewatering methods must be used to prevent the migration of bedding material and to prevent fines from getting into the groove. Any unsuitable or unstable materials below the plan foundation should be removed. Rocks within six inches of the box bottom should be removed. After the appropriate excavation is performed and the subgrade is proof rolled, the box culvert should be laid on compacted granular backfill to the specified line and grade. The bedding design for the box culvert should be designed by an engineer with knowledge about the local ground conditions to ensure a successful installation. The minimum thickness of the bedding material is six inches, or it can be greater if required by the project specifications. The bedding, made up of medium granular material, should be installed and compacted to provide uniform support for the full length and width of each box culvert section. A two inch minimum thickness leveling course of fine granular base material can be used as required to achieve a level bedding surface. The final grading for the bedding should be done with a laser or level and grade stakes. For the final grading, the granular material should be screeded using a screed board as long as the width of the outside span of the box. If properly done, the final grading will allow an easier installation while setting the box culvert sections. Improper bedding could prevent the tongue of the box from being properly started into the groove. It is very important that time be spent to ensure the box culvert bedding preparation is done correctly.